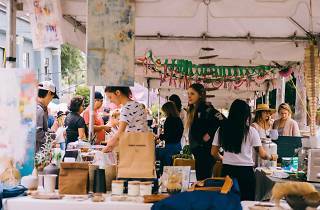 L.A.’s super stylish set has had this weekend’s Echo Park Craft Fair circled (likely in a heart shape) on their calendars since the biannual event wrapped up its last curated market back in May. Over the past few years, the chic shopping affair, which takes place at Silver Lake’s Mack Sennett Studios, has earned a reputation as the place to find plant-based beauty products, ethically-sourced animal hides and small-batch almond butter alongside other bespoke items you might not typically find at something described as a “craft fair,” including—but not limited to—minimalist leather shoes, discretely sculptural ceramic pipes, fine fragrances and sustainable lingerie. Fans of EPCF look forward to brands like Black Crane, Block Shop and Debbie Bean returning year after year, but founders Beatrice Valenzuela and Rachel Craven continue to introduce new talent with each fair—and this season is no exception. 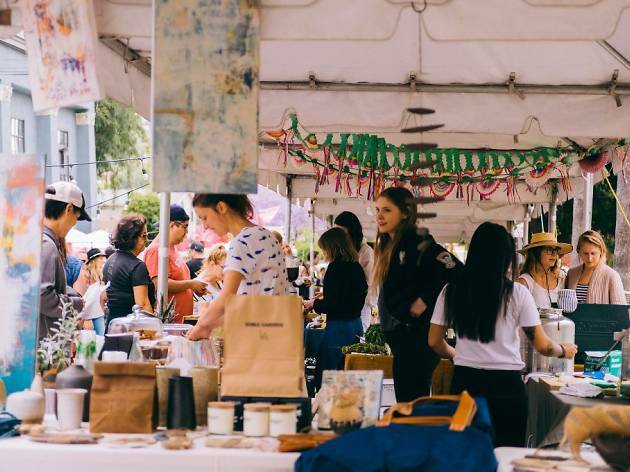 Eight new vendors are joining the fashionable weekend-long fete, and each is bringing something wholly unique to the (beautifully set) table. Lucy Michel will offer her locally made-by-hand ceramic vessels, which have been touted by the likes of Allure and Domino. French intimates brand Baserange will bring along its minimally designed and sustainable bras, undies, and loungewear, while Morrow Soft Goods has the luxurious linens you’ll want to cozy up in when you wear said pieces — kind of a match made in heaven if you ask us. Ethical, sustainable handcrafted bags and shoes by buzzworthy brand Brother Vellies will also be on-hand. For the little ones, make sure to look our for naturally-dyed kids clothing from Rudy Jude. Also making their debut this weekend will be Caroline Z Hurley’s block-printed textiles, Jenni Kayne Home’s cozy housewares, and Kissweh’s hand embroidered accessories. Basically, you’ll be able to take care of even the most discerning folks’ gifts here. Echo Park Craft Fair takes place December 9 and 10 from 10am to 6pm at Mack Sennett Studios. Tickets cost $10 for a single day or $16 for both days.